Following the horrific murders in Paris earlier today, we present a change to our scheduled post. 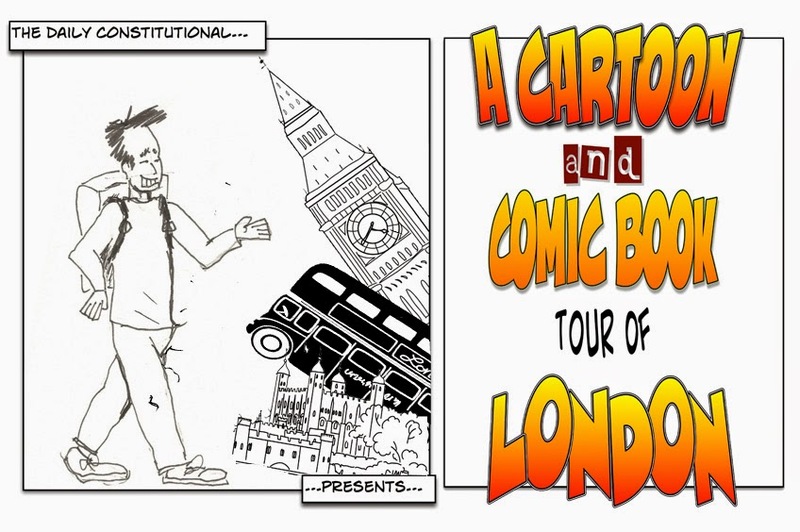 As part of our Cartoon & Comic Book Tour of London we had planned to discuss the ongoing World War Two comic book series Über – a post that we will now hold over until another day. In its place we will continue our tour by paying tribute to a magazine that stands alone in its field, our last remaining satirical news magazine Private Eye. Our thoughts tonight are with the families and friends of those who lost their lives at the office of Charlie Hebdo magazine in Paris. Private Eye. Long may it reign. I love its every scabrous, satirical and sacrilegious dot and comma. Trying to explain to my seven-year-old daughter tonight about the events today in Paris at the offices of Charlie Hebdo. Trying to explain what had happened, why it had happened. I used our own British satirical magazine Private Eye as my prime tool. Private Eye, I explained, is a magazine with cartoons that pokes fun at people. Me: Yes, very much so. But with lots of words, too. Very funny words. "What people does it poke fun at?" All people. Prime Ministers, policeman and priests. Celebrities. Journalists. Everyone and anyone. "Do the people like it when it pokes fun at them?" Do you know what? Yes they do. As a journalist I once featured in Private Eye. It was lunchtime. I was sitting at my desk in South Quay over in the Docklands when my mobile phone started to buzz and ping, while a moment later the landline chirruped into life. I answered the landline. The voice at the other end sang with excitement: "You're in Private Eye!" I thumbed open a text message. Same words. Roughly. u r in Private Eye! I had written a theatre review for The Independent the prose of which had erred on the florid side. On the fanciful side. Pretentious. It may have alluded to "millennial angst". Dearie me. And Private Eye was down on me like a ton o' bricks. My friends were impressed. Which was not the point. A colleague slapped me on the back. Which was not the point. I was thrilled. Which was not the point. Which is exactly why Private Eye should never rest with the likes of egomaniac journalists and celebrities, Prime Ministers, policeman and priests on the loose. Daughter: "Who reads Private Eye?" Me: Anyone in this country. You can buy it anywhere in the UK. "So the whole country was laughing at you for writing silly things?" "But words will never hurt me." No, nor drawings neither, darling, nor drawings neither. 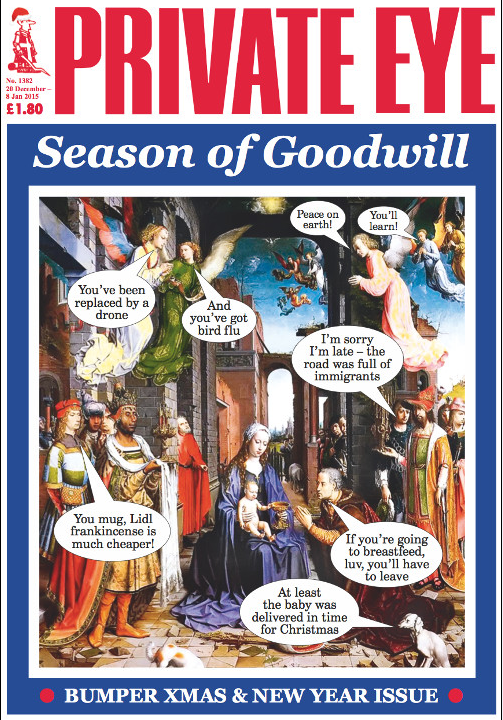 Inside, the magazine is sprinkled with similarly daft cartoons featuring the three wise men, the archangel Gabriel and God. The new issue goes on sale tomorrow. This journalist is thankful that he'll be around to buy it. And buy it I certainly will. Richard Ingrams, Willie Rushton, Christopher Brooker and Paul Foot founded Private Eye in 1961. The comedian Peter Cook helped fund the magazine from the 1960s onwards. It has long been home to the greatest of British cartoonists. Bill Tidy, Michael Heath and Nick Newman among them. Its offices can be found in that iconoclasts' paradise, Soho. I've always loved that: based in Soho and not in Fleet Street. It's right and proper that Private Eye journos and cartoonists should not be seen with their snouts in the same trough as the hacks it so often satirised in the old Street of (Dr)ink. Don't get me wrong: I'm sure they have their snouts in other troughs with different reprobates elsewhere. Good for them. Good satire is thirsty work. "I am appalled and shocked by this horrific attack - a murderous attack on free speech in the heart of Europe. I offer my condolences to the families and friends of those killed - the cartoonists, journalists and those who were trying to protect them. They paid a very high price for exercising their comic liberty. Very little seems funny today."